I recently walked through the oldest wooden building in the world. It is the main hall of a Buddhist temple in Nara, Japan, and was built sometime prior to 730 A.D. Named Horyu-ji (Temple of the Flourishing Law), this complex also contains Japan's oldest five-story pagoda. It was the first Japanese cultural treasure to be added to the United Nations World Heritage List (which includes our Yellowstone National Park and the Everglades). The main hall looked the same as most of the ancient buildings I saw during my weekend tour of historic Nara and Kyoto. It appeared clean, sturdy and well-maintained, if unpainted. The largest wooden building in the world is also in Nara, at the Todai-ji (Great Eastern Temple). Known as the Daibutsu-den, this structure was built in 1708 and is 150 feet high, 187 feet wide and 165 feet front to back. It houses a 60-foot-high Daibutsu (Great Statue of the Buddha), the largest bronze statue in the world. A sign at the Todai-ji advertised fortunes in English, Chinese and Japanese. It said: "Keeping your wishes in mind, Shake well this fortune box. Remember your number of the stick from the small hole." A Lost Thing: That thing will be found. A Person For Whom You Wait: That person will come. Lawsuit: If you are right, you'll win. Illness: You'll recover your health completely. A good fortune is supposed to be tied high on a tree branch in the hope it will come true. Bad fortunes are tied near the ground, and the purchaser asks for better luck next time. I kept mine as a souvenir. Of the ancient temple buildings that still survive in Japan, many are concentrated in Nara and Kyoto, the two historic Imperial Capitals. These structures are remnants of temple complexes whose buildings were burned and rebuilt several times throughout the centuries. Nara became Japan's first permanent national capital in 710 A.D.
During earlier centuries, the seat of government had changed with each new ruler, but this custom was discontinued when administration grew too complex. In 794 Kyoto was laid out in the wilderness to be the greatest city in the world. It served as the Imperial Capital almost continuously from then until Tokyo claimed the title in 1868. Unusual for Japan, this city has parallel streets and actual city blocks. It contains 1600 Buddhist temples and 270 Shinto shrines, and receives ten million visitors per year. Having been the Japanese cultural center for over a thousand years, the city was purposely spared destruction by the U.S. military during World War II. One of the World Heritage List properties in Kyoto is a Buddhist temple called Kiyomizu-dera (Clear Water Temple). Located on a mountain above the city, it possesses a main hall built in 1633 with a wooden veranda jutting out forty feet from the mountainside. 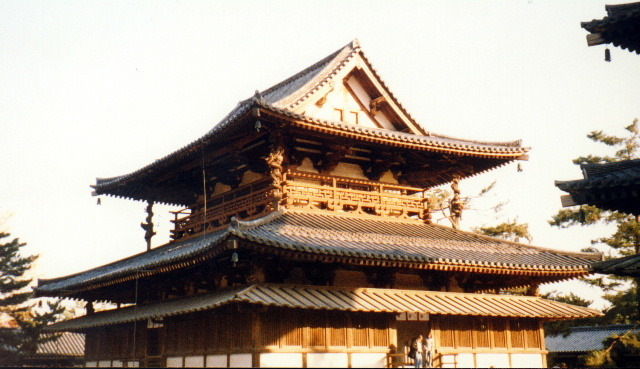 The wide veranda is supported by a scaffolding of zelkova-tree pillars and was constructed without nails. All pieces were fitted together like a jigsaw puzzle. I walked across the sturdy veranda and then followed a path through brightly-colored autumn-dressed trees along the base of the scaffolding. Two warrior statues guard the entrance to Kiyomizu-dera. Known as Deva Kings, the one on the right is called "a" and has its mouth open. The one on the left is called "um" and has its mouth closed. Since "a" and "um" are the sounds of the first and last letters of the Sanskrit alphabet, the Deva Kings represent the total spectrum of Buddha's teachings. Another historic monument on the World Heritage List is Nijo Castle, built in 1603. The walled complex is surrounded by an outer moat, with a guardhouse at the entrance. Inside is the Ninomaru Palace and an inner moat to contain the major defensive positions. After removing our shoes, we walked through the seven connected buildings of the Ninomaru Palace. ts nightingale floors, designed as an alarm system, squeak when someone walks on them. Ceramic clamps under the wooden floorboards rub against nails and create a birdlike sound. I moved away from the crowd in an attempt to hear the musical chirping sound as I walked across the worn wooden boards. One of our stops in Kyoto was the Temple of the Golden Pavilion, part of a villa built by a Shogun in 1397. The setting sun flashed against the glittery gold-leaf surface of the pavilion as we came around a corner and saw it on the far side of a pond. Actually, we saw it twice, because of its reflection in the water. Multi-colored autumn leaves on the surrounding hillsides added to the beauty. This was an exact reproduction of the original pavilion, destroyed by arson in 1950. Our tour guide said one of the temple's acolytes, ugly in appearance, had envied the attention showered on the beautiful pavilion. He thought he would attract attention to himself by burning it down and committing suicide. He didn't go through with the suicide, only the arson, which definitely did bring him attention. Our tour guide didn't know what punishment was administered. Between Kyoto and Nara is the Byodo-In Temple, built in 1052. Its main hall was designed to represent the Phoenix, a mythological bird of Chinese origin, in the act of descending to earth. As I walked around the outside of this huge, beautifully carved Phoenix Hall, I could see the shape of a bird. The central hall represented the body. Covered walkways reached out to the sides like wings. A rear corridor formed the tail, under which the Uji River ran until being rerouted. In days of old, people could stand in the "tail" and fish from the river. Of the many impressive architectural structures I saw that weekend, this was one of the most spectacular.